Just when you thought it was safe to look at the calendar again. 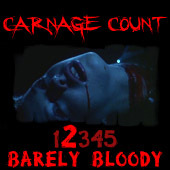 Since it arrived just a year after Sean Cunningham’s breakthrough slasher hit, you’d probably peg Saturday the 14th as the world’s first slasher spoof, but it isn't (and even if it were, Student Bodies would have beaten it to the punch by exactly one week in 1981). Instead, it takes aim at the haunted house trend that had peaked with The Changeling a year earlier and was slowly crumbling its way to irrelevance at the time. 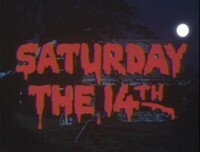 However, Saturday the 14th really goes back beyond the 70s horror cycle, as it’s an old-fashioned, corny goofball romp that’s difficult to classify as either a spoof or a parody--instead, it’s just a big dumb haunted house movie that finds a reference point in the Universal classics more than anything else. Waldemar (Jeffrey Tambor) and Yolanda (Nancy Andrews)--clear stand-ins for Dracula and his now nagging bride--are looking to buy an abandoned, decrepit house in Eerie (read: Eeeeerie), Pennsylvania. Unfortunately, the house they’ve settled on has recently been inherited by John (Richard Benjamin) and his family after his uncle passed away. Upon moving in, the youngest (and smartest) member of the family, Billy (Kevin Brando), finds The Book of Evil and opens it; the pages intone that Friday the 13th might be bad luck, but “things get really bad” on the next day--Saturday the 14th, when all of the world’s evil will be unleashed during his parents’ house party. Of course, when you’re working with a New World Pictures budget, “all the world’s evil” translates to a bunch of guys in rubber suits skulking around the house while the tenants react inappropriately (all the weird noises--from a monster falling out of a window to a bunch bats--are written off as “darn owls,” for example). I guess the vagueness of the plot is supposed to be one of the jokes--we’re told the end of the world is imminent, but most of the various monsters are kind of flitting around in the background causing trivial havoc by washing the dishes and eating sandwiches. The local television station only plays The Twilight Zone on a loop, and some of the film’s more clever laughs come from the obviously fake Rod Serling narrations in the background. Most of the humor is of this sort--silly, buffoonish, juvenile gags that come at the expense of most of the characters’ stupidity and ineptitude. In this respect, Saturday the 14th much more of a farce than a satire since there’s no sense of self-awareness. Despite all of the obvious signs, no one points out that they’re in a horror movie; in fact, Richard Benjamin gives an awesomely deadpan performance as the family patriarch. His reactions are sometimes quiet and low-key, such as when he notices a pair of eyes floating in his coffee and shrugs it off. Other similarly screwy turns are turned in by Paula Prentiss (the mother who insists everything will be okay once the house has curtains) and Severn Darden (the film’s bumbling Van Helsing who masquerades as a bat exterminator). Everyone plays dumb, save for the two children, which is probably why Saturday the 14th feels like such a kids’ movie at times, as it mostly aims for the silliest, basest laughs. The film isn’t without its obvious horror references, though, since many of the monsters carry classic designs. There’s an obvious Gillman creature that emerges from the tub in a scene that also doubles as a Jaws gag as well as some fun banter between Dracula and his wife (though one joke gets run into the ground when it's repeated). The film’s variety of monsters is fun and makes the film a visual treat, but this sort of monstrous cornucopia would be better executed in The Monster Squad later in the decade. This one ends up just feeling sort of like a kid-friendly version of House, albeit without the manic energy. Saturday the 14th feels like it should be more madcap and zany, and it’s a film with an idea that might have been done better justice had it fallen into the hands of John Landis or Joe Dante (who had just left the Corman stable). Instead, it’s just another cheapo, dumb Corman production (from Julie rather than Roger) with Howard Cohen at the helm (he would return a few years later with Saturday the 14th Strikes Back), but it’s a harmless type of dumb. It’s not exactly an eye-roller, and it breezes along with a 75 minute runtime, but it’s hardly a gut buster since the script rarely shows signs of real ingenuity, save for a twist that gets diluted by the puerile shenanigans that accompany it. Like many of Corman’s offerings, it was a New Concorde release on DVD about a decade ago, so it’s long out of print; however, it’s currently streaming on Netflix, where it’s well-suited for a late-night palette cleanser once you’ve gorged yourself on a Friday the 13th marathon or something. Saturday the 14th really couldn’t be any further removed from the title it’s riffing on, but I guess that’s the big joke…or it could just be a quick way to cash-in on a notorious film from a year before (the Corman way!). Rent it!